As the Marketo Marketing Nation Summit comes to a close, I am reminded that it truly has never been a more exciting time to be a marketer. Our LinkedIn Marketing Solutions team’s ideas cup is brimming with rich takeaways from sessions and conversations with marketers across these past two days. If you missed our lessons learned from Day 1, including highlights from the keynotes with Phil Fernandez, Arianna Huffington and John Legend, you can find them here. 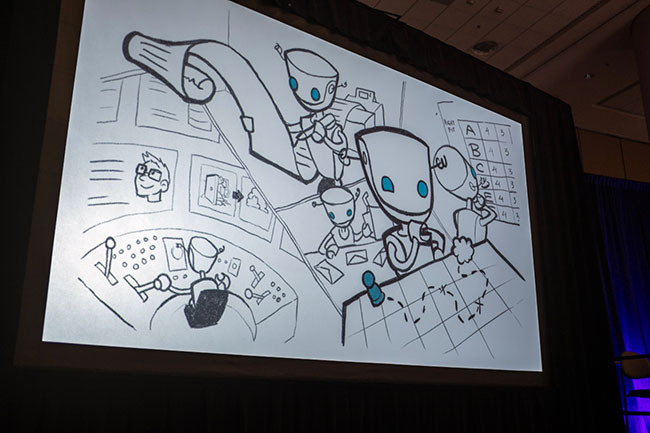 Our own Russ Glass, Head of B2B Products at LinkedIn, also made a pretty exciting announcement during the opening keynote, which you can read more about in this blog post. As for Day 2, the insights are too good not to share. Dive in to the topics we found most relevant and actionable for you as a modern marketer. 1. To stand out in today’s noisy world, capture attention through triggers like disruption, mystery and reward. Ben Parr, author of Captivology and co-founder of DominateFund, practiced what he preaches in his book by capturing the attention of his session attendees immediately – with a confetti gun. In doing so, he leveraged what he calls the automaticity trigger, generating an automatic response of jumping out of our seats in surprise without thinking. As brands think about how to stand out in the crowded landscape, where attention spans are shortening by the second daily, Parr implored us to up-level our game with his 7 captivation triggers -- Automaticity, Framing, Disruption, Reward, Reputation, Mystery and Acknowledgement – which he covers in more detail in his book. Disruption was one of the triggers that stood out, naturally, because as Parr put it, “We have a stronger memory for things that violate our expectations.” For example, when Patagonia ran a campaign that told consumers “Don’t buy this jacket”, it doubled sales in 9 months. If you read deeper into the campaign, it became clear that the company was taking a socially responsible angle to support smarter consumption of our environmental resources; but they led with the disruptive headline – and that disruptive headline sold jackets. Parr cautioned, however, that disruption must always match brand values. In the case of Quiznos, the brand produced a commercial in wish singing rodents invited you to come buy a sandwich from the sandwich chain. The problem with this: no one wants to see a rodent anywhere near something they are going to eat. In the end, this kind of disruption approach did not pan out for the company, which recently filed for bankruptcy. Mystery was another trigger often used to keep attention. Think about the cliffhangers at the end of each episode of Game of Thrones, or the fact we’re all still swept up in what happened to that Malaysia Airlines plane because, well, we still don’t know. Parr explained that we have a stronger memory for incomplete tasks or incomplete storylines, because we actively try to reduce uncertainty where we can and continue to keep attention as we look for the resolve. As a marketer, you can create suspense by building up anticipation to a major announcement, or perhaps create a podcast series where you leave the audience gripping to hear the next episode. As you think about your content plan though, ensure it has an element of participation and reward for your audience. "We pay close attention to those who pay close attention to us,” said Parr. Involve your audience in the creation of your story, your content or your product, and reward and acknowledge them for their contributions to elicit the ultimate attention and advocacy. 2. The top of the funnel has been ignored for way too long. Charles Eichenbaum from Microsoft told a story about how his team’s content strategy was missing a lot of top of the funnel content. The result was that their prospects were finding competitive content without a direct line to the story Microsoft had to tell around cloud computing. So, his team took it to the whiteboard and visually sketched out their buyer’s journey across the office. Then, they hired an artist to come in and turn this journey into storyboards and even developed characters for what would turn out to be a really fun and informative story. They focused on a character they called Blue, who would help their prospects find content very early on in the journey, then guide them through nurturing, and finally celebrate their success and ultimately turning that prospect into the hero (something all marketers should focus on doing better). 3. Do more with less by getting the most value from your content at every step of the journey. According to a recent Sirius Decisions report, 70% of content is going unused. That’s quite a disturbing stat for the modern marketer. 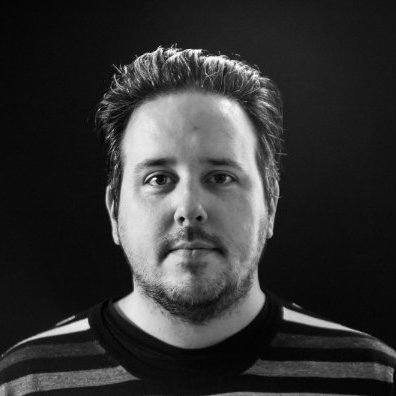 Kapost’s Director of Content, Jesse Noyes, addresses the issue with what he calls “The Content Pillar”. Noyes says, “It’s not about another campaign, or another set of technologies, it’s about creating value across the buyers journey”. A Content Pillar is an in-depth asset addressing a buyer need that is themed and can be broken into many derivative assets to be distributed across multiple channels at several buying stages. We use a similar concept here at LinkedIn but instead of a Content Pillar we call it a “Big Rock”. 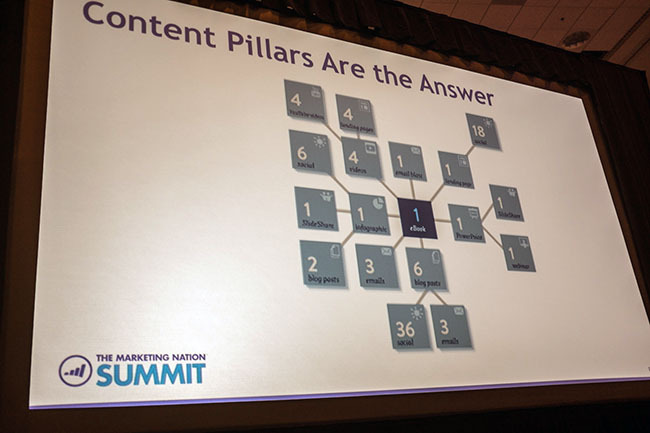 Then, we use the Turkey Analogy for repurposing the main content piece into several smaller snackable pieces in a very similar way that Jesse talks about the Content Pillar. By focusing on either a Pillar or a Big Rock, it helps us move towards the creation of not more content, but instead more relevant content. At the end of the day, it’s doing more with less by applying a strategy that is both repeatable and scalable. Kapost has seen success with this tactic and so have we. 4. Predictive lead scoring is a promising new frontier for B2B marketers. Brian Kardon is CMO of Lattice Engines, a predictive analytics company that uses big data principles to analyze closed-won deals of its client. Lattice looks at offline and online characteristics of a company’s buyers to determine what attributes identify the most likely buyers. For example for one client, Juniper Networks, Lattice Engines discovered that prospects who had signed a lease for new office space are the most likely to buy Juniper routers. At the Marketo Marketing Nation Summit, two Lattice Engines customers, FireEye and MuleSoft, shared their experiences with predictive lead scoring. Working with Lattice Engines, FireEye was surprised to find that prospects below the level of CIO had had an outsized influence on the ultimate buying decision. MuleSoft discovered that prospects who were using SaaS software, such as Salesforce.com, were among its most likely buyers. The results show these kinds of insights contribute to revenue. MuleSoft said that its monthly sales opportunities were up 24% in the first six months after starting to work with Lattice Engines. 6sense is another predictive analytics company, and its CEO, Amanda Kahlow, led a session showcasing the company’s work with two clients, Xactly and Blue Jeans. Both companies are using 6sense’s predictive data -- which combines attributes as well as behavioral data, such as whitepaper downloads, to identify companies that are currently in the process of buying. Hanne Venables from Xactly said the company had a high success rate with leads that are scored with a high likelihood to buy. More than 85% of closed deals had a score of 5 or higher on a 10-point scale. Similarly, Abdallah Al-Hakim from Blue Jeans said the company did an experiment comparing 6sense’s hot leads with regular marketing qualified leads. The 1800 standard leads yielded just 15 opportunities, while the 1800 leads from 6sense generated 299 opportunities, about a 20x boost in performance. 5. 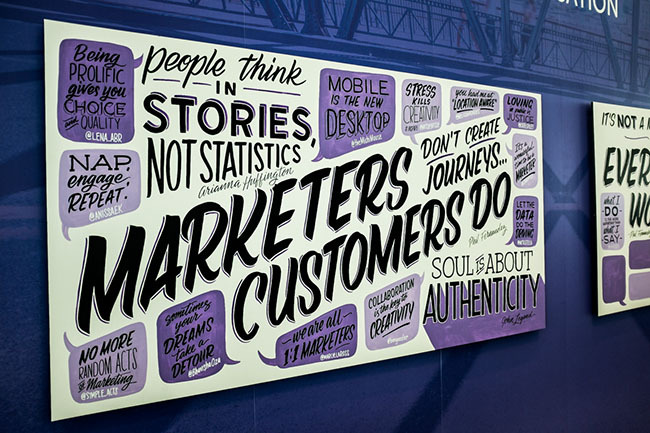 As marketing organizations scale, it’s important not to lose the human element of authenticity. 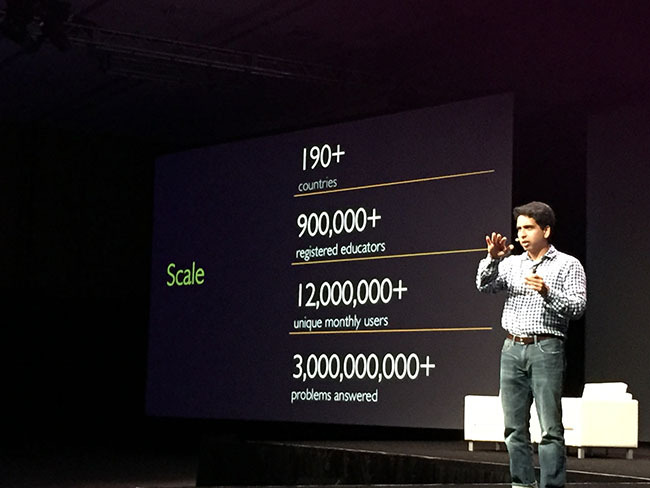 In the closing day's keynote, Sal Khan shared with us the story of how Khan Academy came to be and also where it's headed today. When asked about why he chose to go the route that he did, building a not-for-profit company with a mission to give a free, world-class education to anyone, anywhere, Khan referenced a quote by John Legend, "What would you do if you really love somebody?" The original videos made through Khan Academy were made for his cousin, Nadia, whom he loved and wanted to help advance in school. Today, even as the company has scaled to help educate over 12 million students, Khan says he's proud that they still have an element of authenticity and human touch. He talks about how they could have hired a large production company to do impressive graphics and record the lectures like any other programming could, but that's not Khan Academy. Khan Academy is the nerdy math teacher who loves math so much that he lights up when talking about it, and may not be as polished, but genuinely wants to help students learn and does so in his videos online. Khan reminded us that people want to connect with people; so as we think about building and scaling our marketing organizations through technology today and in the future, we must not lose sight of that element of humanity. As we all head back to the office today, our business card stock pile a bit taller than it was at the start of the week, it may be tempting to reach out and start looking to bring on new technology solutions. The challenge I give you is to ask what you need to do to help your company succeed, and then who can help you get there. And as you bring on new partners to help you optimize your content production process or embrace predictive lead scoring, remember to not lose that human touch. Build for the relationship, not just the sale. Want more insights on how to build relationships with your professional audiences through the help of LinkedIn? Check out our all-encompassing guide, including interviews with marketing thought leaders and tips to help you succeed.